The Piffle Snonker (or pavior's beetle) was one of the working tools and implements for the VATS along with the likes of the Oast Box and mallet and block. 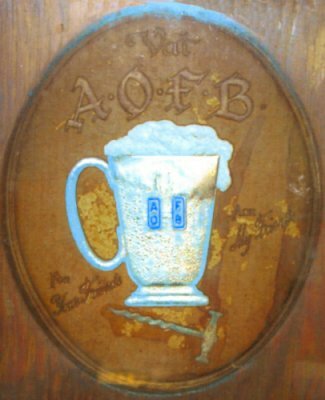 The sceptre like Piffle Snonker is around 18 inches long made of brass or nickel plated heavy metal with the AOFB jolly brewer (gnome) sat on a barrel atop. They were made by the Birmingham Medal Co. and were priced at 21/- (21 shillings , £1.05 decimal). The items were all used in the ceremony of VAT meetings. VAT seniority was decided by Membership booklet number, and as it was likely that it was the publican who recruited blowers within the establishment he would be the Senior Blower or Chairman of the VAT. The Senior Blower would call the meeting to order once the piffle snonker, thumb screw (to preserve order and dignity) and assistant vice gargler (scrounger for the collection of fines) were in place with with the command "Shoot your Linen Blowers". Attendees would then thrust their arms forwards in an effort to reveal their shirt cuffs and cufflinks, fines ensuing for lack of cufflinks. 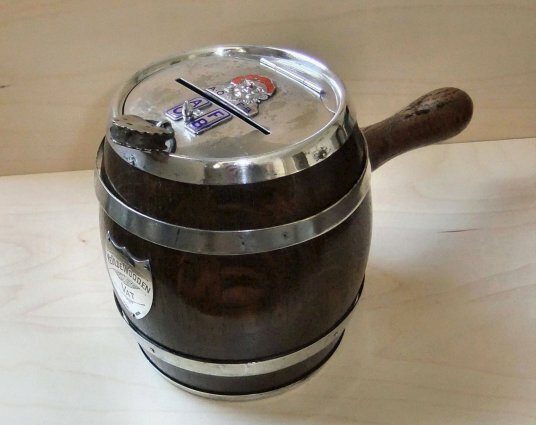 Fines could be hefty , often at the discretion of the Chair, involving the drinking of beer from an eggcup for an hour, monetary donations to the VAT Oast Box or reportedly buying a round of drinks for all members present on occasions. As the fines could be quite harsh it is hard too imagine that cufflinks were forgotten, unless as a deliberate measure in a charitable act. Early cufflinks were known to be prone to breakages and possibly un-wearable but no fine was levied as long as all component parts of the links were presented. 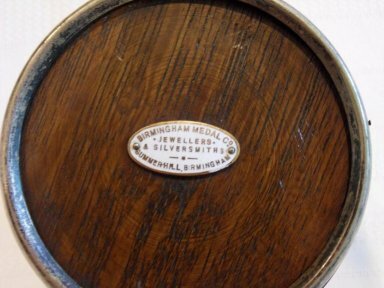 The Oast Boxes and Mallet (gavel) and block were manufactured by the Birmingham Medal Co. 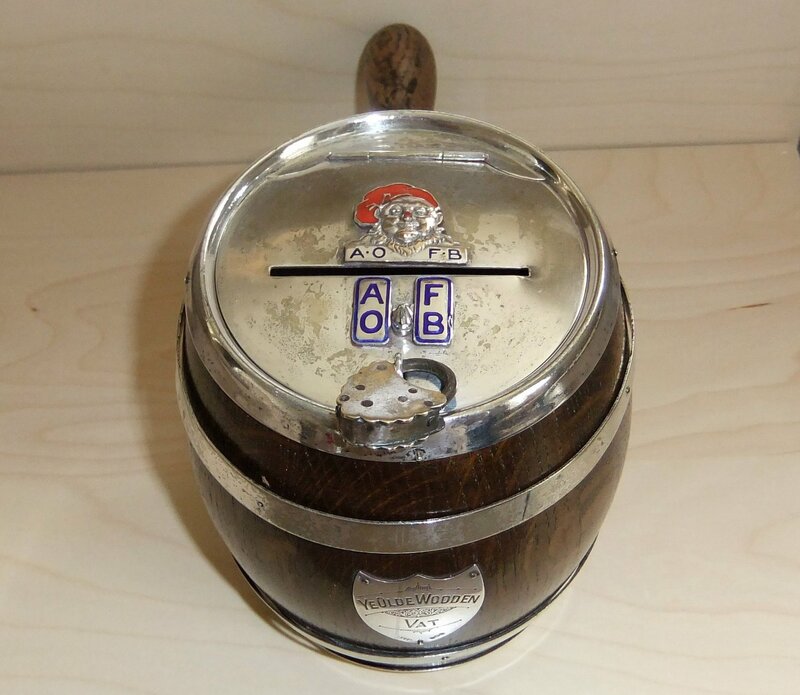 The Oast Box was made of oak with AOFB cufflinks attached with a lock and key and a silver shield engraved with the name of the VAT and designed to look like a miniature beer barrel. They were priced at 21 shillings. 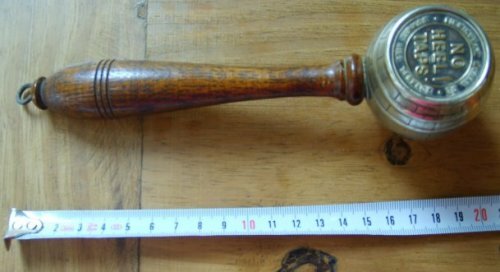 The Chairman's mallet was silver plated and enamelled, again designed to look like a miniature barrel of beer, priced at 15 shillings (75 p decimal). 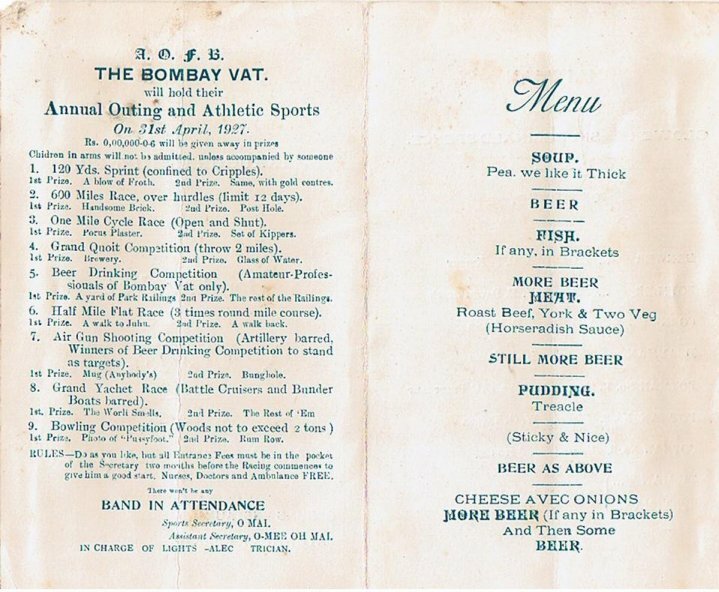 VAT meetings often consisted in the partaking of beer, baccy and roast beef with singing an integral part of the evening with both the Froth Blowers Anthem and the National Anthem being sung. Blowers were always keen to take part and it was commonplace for Blowers to perform their party pieces remembering that most pubs and clubs of the time had a piano and pianist. It was even known that for serious irregularities a Blower was to telephone a complete stranger and render as verse or two of the Froth blowers anthem. Full details regarding VAT meetings and proceedings can be found in the membership booklet. Pages 21-23. 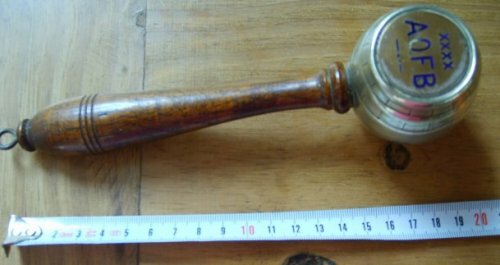 Vat Implement - Gavel , photo courtesy of ex-pat Kay Green. Vat Plaque courtesy of Chris Murray. 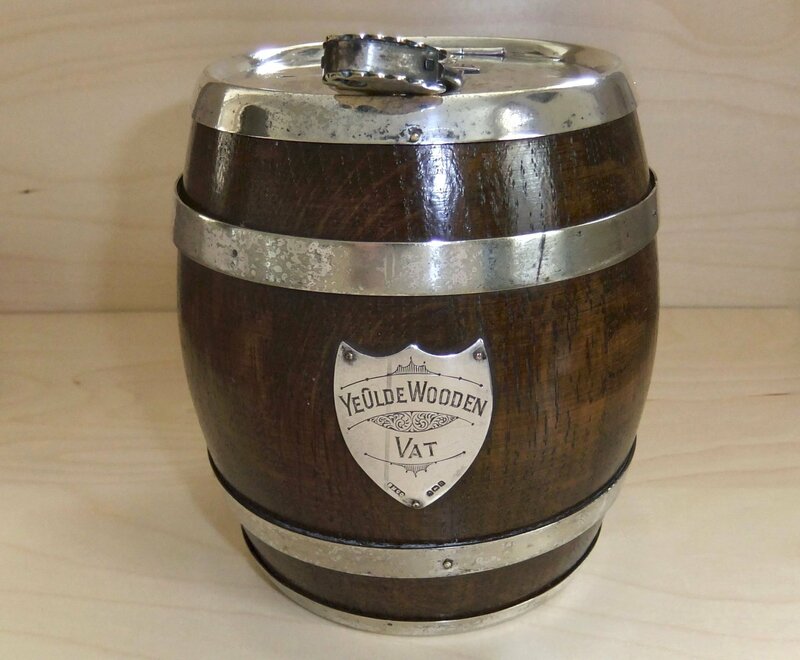 Barrel Oast Box from Ye Olde Wooden Vat, London, Ontario, courtesy of Doreen and Bill Newsome in Canada. 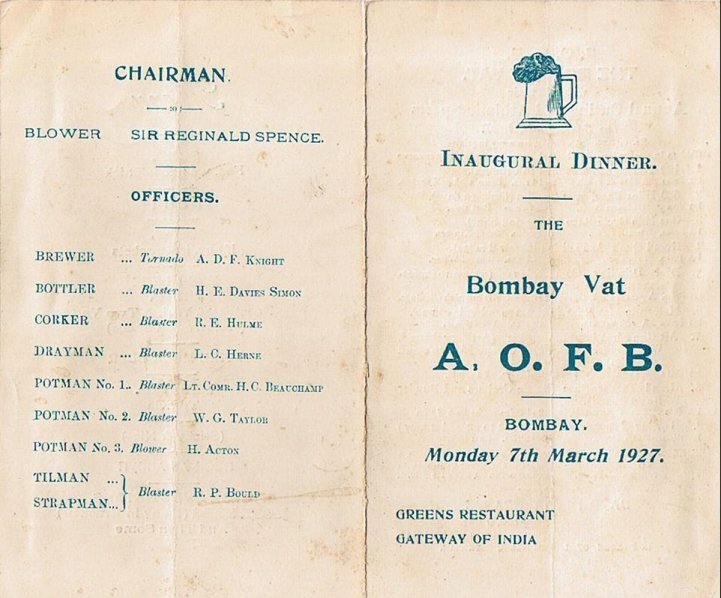 of the Bombay Vat March 7th 1927 that was held at Greens Restaurant, Gateway of India, Bombay. Pictures courtesy of Nigel Ricardo. Corkscrews were another of the Vat tools - large, gilt with attached cufflinks - not seen any yet - is there one/some out there ?